The high quality results match injection-moulded details. The method yields a fantastic level of detail and a very high finish, lower tooling costs and shorter lead-times. The process has a limited environmental footprint as the material does not contain any solvents; neither does it cause any harmful emissions. Medical equipment, lighting, doors, shutters, front panels, components for the aerospace, boats, cars and trains. 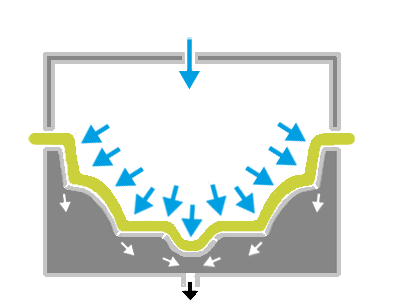 High Pressure forming involves the use of compressed air and heat. 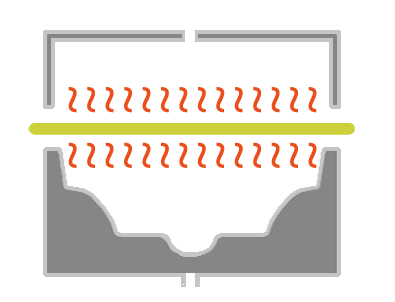 A negative tool is placed in the bottom of the machine, and with the aid of compressed air, a pre-heated thermoplastic sheet is pressed down into the mould. The tool is placed in the High Pressure machine. The sheet is inserted. 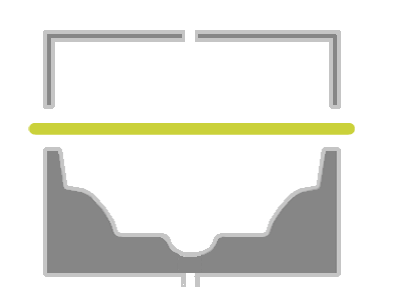 The sheet to be formed is heated from above and below to between +170-210°C. Using compressed air, the warm and soft sheet is pushed down into the tool. Up to a pressure of 5 bar. 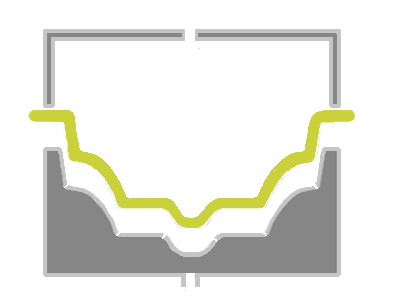 Around five times the pressure used in the injection-moulding process.